Intel’s (s intc) newly minted CEO Brian Krzanich reassured analysts about the company’s prospects following news on Wednesday that the company’s quarterly income had dropped 29 percent, slightly off from analysts’ expectations. The earnings statement from the company’s second quarter showed net income at $2 billion, down from $2.8 billion year over year. Net revenue of $12.8 billion came in under analysts’ $12.9 billion estimate. Those same analysts had expected $0.40 in earnings per share, and they got $0.39. A big part of the revenue slide has to do with continued weakness in the PC market. 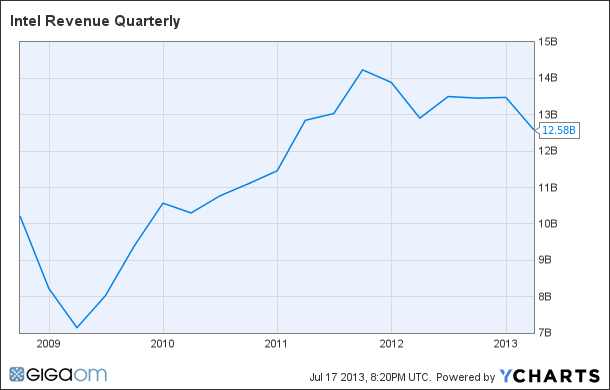 Revenue from Intel’s PC group was down 7.5 percent year over year to $8.1 billion in the quarter ending June 30th. The other Intel architecture group targeting smartphones, tablets and netbooks experienced a 15 percent drop, but that revenue — $942 million this time around — pales in comparison to Intel’s revenue from PCs. And that is what Krzanich appears to be most focused on. Krzanich has been talking with customers and employees and talking about the company’s strong and weak points. He admitted that the company was “slow to respond to the ultra-mobile PC trends.” But since Krzanich took the company’s reigns from Paul Otellini, Intel announced a reorganization that will help company become more nimble in that quickly moving area. “I’m excited about what lies ahead,” he said. The company is on track to start production with its next-generation 14-nanometer technology later this year and get products to market built on that process in the first half of next year. That’s important, but in the meantime Intel is banking on fanless Haswell Core chips and forthcoming Atom-based Bay Trail SoCs to perform well in mobile devices. Convertible, or two-in-one, devices, were of particular interest. Executives think Bay Trail specifically will help get it into lower price points for tablets. Asked if x86 processors can do well in ultra-mobile devices when the ARM architecture has been so popular, Krzanich — as might be expected — responded in the affirmative. “My answer would be (customers) are more than willing to accept it,” he said. “The fact that x86 works on both Android (s goog) and Windows (s msft) is a real advantage to our OEM base,” he said. Intel’s data center group, focusing on servers, workstations and storage computing, posted $2.7 billion in revenue in the quarter, roughly flat year to year. That follows previous year-to-year gains in the business unit.